Studio Tour is a narrated ride in Upper Lot at Universal Studios Hollywood. While it's not the best, it is also recommended. Started in 1964, the Studio Tour was the original (and, at first, only) attraction at Universal Studios Hollywood. 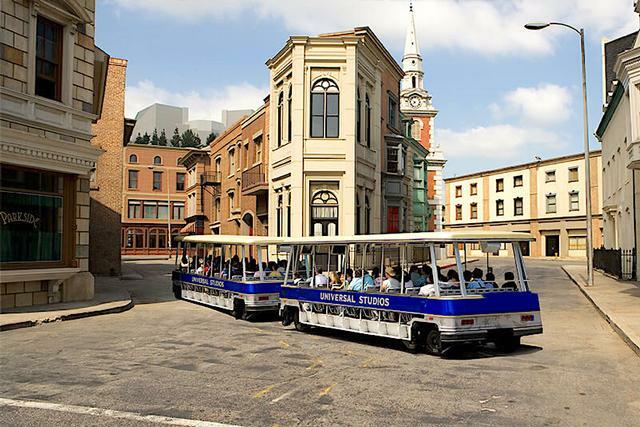 The 45-minute tour, hosted by a guide and supplemented by on-ride HD video screens, takes you past the front lot soundstages and backlot sets where thousands of films, television shows and commercials have been filmed over the years. On your way past these sets, you will pass several special effects demonstrations created specifically for the tour, including a simulated Earthquake in a San Francisco BART station, a Flash Flood in Old Mexico, and an attack by Bruce the shark from Jaws... in a New England seaside village that later was used as the set for Cabot Cove, Maine in "Murder, She Wrote." A fire on June 1, 2008 destroyed some sections of the Studio Tour, including the original King Kong encounter and the Courthouse Square set featured in "Back to the Future." A new 3D, 360-degree King Kong experience opened in 2010, and in 2011 the Studio Tour's on-board video presentation was re-written and re-filmed with host Jimmy Fallon. In June 2015, a new "Fast & Furious: Supercharged" 4D encounter debuted as the final act on the tour. Featuring many of the stars of the "Fast & Furious" movies, the encounter takes you on a simulated high-speed (and explosive) chase through downtown Los Angeles.